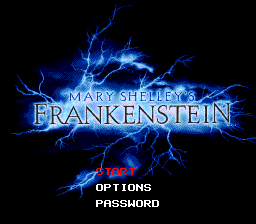 Mary Shelley's Frankenstein is a sidescrolling action game for the Sega Mega Drive based on the film with the same name. It was only released in North America. A completely different version, in the style of a graphic adventure rather than an action platformer, was also produced for the Sega Mega-CD, which was sold as part of the Mary Shelley's Frankenstein / Bram Stoker's Dracula bundle, and was a US-exclusive release. Main article: Mary Shelley's Frankenstein/Magazine articles.